Occupy song & happy melody to sing & dance for peaceful and creative protest. In solidarity to the Occupy-Movement, and to the worldwide potesters and the Blockupy protest in Frankfurt at 1th of June 2013, which was prohibit by the german police / Interior Minister Boris Rhein (CDU). 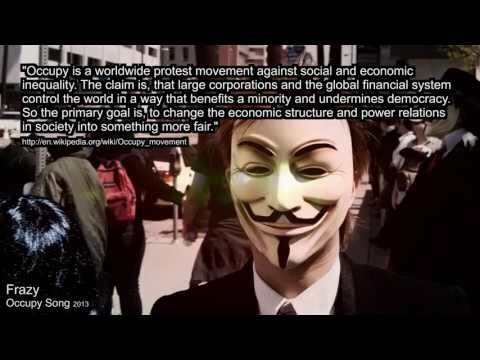 Occupy is a worldwide protest movement against social and economic inequality. The claim is, that large corporations and the global financial system control the world in a way that benefits a minority and undermines democracy. So the primary goal is, to change the economic structure and power relations in society into something more fair. is the poorness of the poor. ist die Armut der Armen. To be english friendly, songs which have english lyrics from now on will be published by "Frazy", not by "Synapsenkitzler". All Photos from occupy protests from all over the world are under Creative Commons-licensed content for commercial use, adaptation, modification or building upon from flickr.com. For detail credits check XXXXXXXXXXXXXflickr-album. Do sustainable lifestlye and ethical consumerism. Use ethical banking to place your money.